"On remote Codfish Island off the southern coast of New Zealand live the last ninety-one kakapo parrots on earth." This talented author/illustrator duo introduces us to the exotic parrot and its equally unique habitat and then leads us along with the dedicated scientists and volunteers who are determined to save this beautiful bird. Beginning with a softly hued map we are oriented on the globe and we meet the brilliantly plumaged parrot that lives on the ground and is now subject to the predators man has introduced into its environment. This is a a visual feast that simultaneously inspires and informs. Nic Bishop's photographs are vivid as always. A great book for any child interested in knowing more about the natural world and perhaps, finding some new, real heroes. 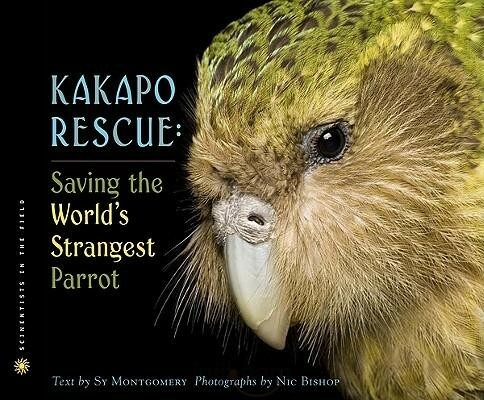 ******** On remote Codfish Island off the southern coast of New Zealand live the last ninety-one kakapo parrots on earth. These trusting, flightless, and beautiful birds—the largest and most unusual parrots on earth—have suffered devastating population loss.